hello again! lately i have been obsessed with art. it is pretty much all i want to buy at the moment. there are sooo many talented artists out there that i love so i thought i would start sharing a few of my favourites. my friend introduced me to this artist many years ago. i love him. i hope everyone had a good weekend. talk to you soon! OMG, love, love and especially that last one. so many people have told me i would regret my kurt halsey half sleeve but over three years later, i still love it like i did the day i got it. the four pieces (and little piggies from "numb") all mean so so so very much to me. he's truly brilliant. 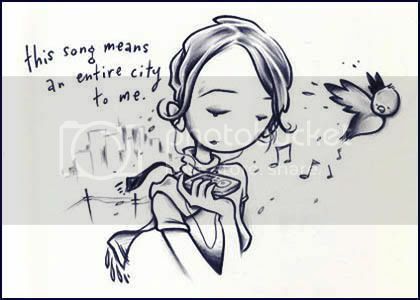 oh, and i even have that 4th one "this song means an entire city to me" on the inside of my elbow! ahhhh loveeeee! For some reason his drawings remind me of childhood. They are great! I'm visiting via Freckled Nest and am glad I've found a great new blog. P.S. Love you shop too--the hair bows are precious. I like Kurt Halsey's use of words on his illustrations. Your mustache cracks me up. haha. Your head bands are so clever! The art work is adorable! I came via Freckled Nest and can I just say that your Word Bubble Headband rocks my world. I love it! How sweet. I found your blog from Freckled Nest. Love your headband. So different. I love it. So adorable. these are so great, ive never heard of him before! Hi, I found you via Freckled Nest - You have some great headbands! I am so Inspired! Thanks to FN you have a new follower! Love it! & these prints are really pretty & inspiring, I love the quotes on them! Just came from FN.. and this post was a great one! my favorite is the first one ;) adorable! Awww I love Kurt Kalsey... so inspiring. Great post! ooooohhh i love your little cupcake headband! just checking out your store, popped over from freckled nest. LOVE Kurt. He had an exhibit here in PDX a few years ago. I was lucky enough to meet him and have a picture snapped with him and snag a few autographs on some prints. He was fantastically nerdy and wonderful. It made me love him even more.